The triple bunk bed may be the perfect youth bunk bed. 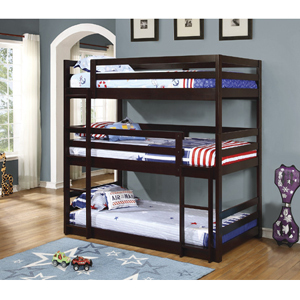 This bunk bed is constructed from top quality wood and is finished in cappuccino finish. This twin over twin over twin bunk bed is perfect for a multi-child room, designed to be extremely durable and functional. The top bunks feature safety rails on all sides, metal to metal connection for strength and durability, and under bed slat support system. The twin bunk bed can easily convert to two separate units.